Various types of these ‘invasion’ armflags were worn by paratroopers in the course of the war. They were worn specifically by paratroopers to identify them as American forces because paratroopers would be dropped behind enemey lines and risked to be mistaken for Axis soldiers by the main US assault forces approaching them over land. Flag patches continue to be worn by US forces of all branches of service today. The different types of WW2 armflags are theatre specific. Some types were used in more than one campaign, as explained below. All had 48 stars – one for each state. The current US flag has 50 stars. The differences are in size and material. The earliest type was a small 12 x 7 cm (3 x 5 inch) flag printed on very lightweight cotton gauze fabric. 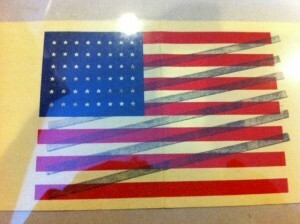 This type of flag was only issued to 82nd Airborne paratroopers for the Sicily and Normandy jumps. Note that no flags were used for the first combat jump in Tunesia. For Normandy, remember: flag = 82nd; gas detection brassard = 101st). 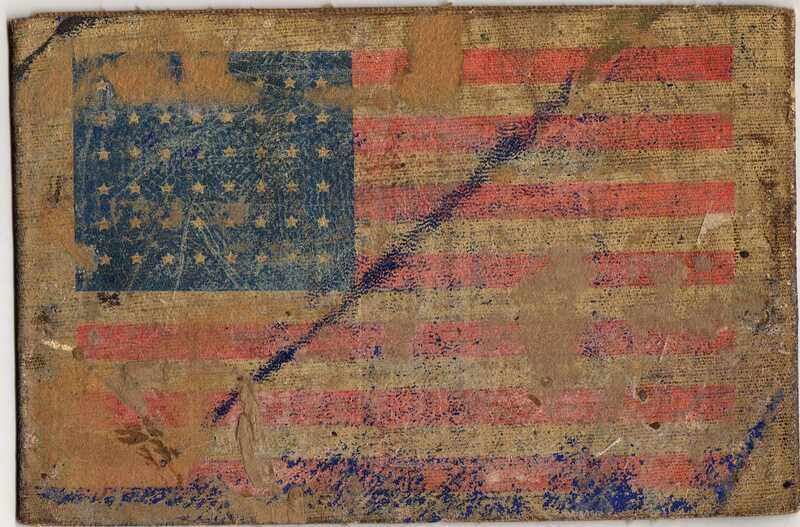 As can be seeen on period photographs, these flags were loosely sewn or pinned onto the right sleeve. It can also be seen that these quickly came loose and faded in the sunlight. Such flags seen on original uniforms today are usually completely faded. These early flags are now very rare and fetch high prices at auctions and are invariably unworn. 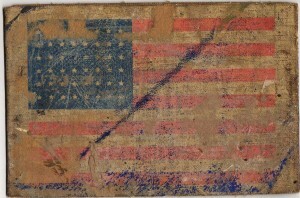 1st type invasion armflag printed on cotton gauze Similar flag with stars upside down. The examples in the pictures above are both reproductions Davy Berry, the pathfinder historian, was so kind to point this out to me. He can state this with some authority since he made both examples. The one on the left with faded star field dates from 1982-83 and he made these for the 82nd Airborne Historical Society which was part of the C-47 Club as a way to raise funds for the the Airborne Museum in Groesbeek. The promotion was called “Buy a Flag–Buy a Brick”. He does not recall how many we sold but many were sold through STATIC LINE newspaper. So mine (at the left) may well have come from the estate of a 505 vet, as I was told, but it wasn’t the actual flag he was issued for the Sicily jump. At the direction of the head of the Society, David sent a large quantity to the Airborne Museum in Ste Mere Eglise. Most of the flags on the mannequins at the Museum are his reproductions, is what he told me. Many more were sold in the Museum Shop. The example on the right was also made by David but within the last five years (this update is from 2011). He made a small percentage with the star field reversed. Yes it is a very unique mistake found in the original production runs. You will notice the more solid “white” field behind the red stripes, especially on the right side of the flag. This is a starch sealer that David used to fix the color fields and how he recognized his work in the photos in my article. These flags are usually sold through At The Front. The second type was larger (13 x 9.5 cm) and printed on stronger shirt-weight cotton with a hemmed edge. Most commonly, these flags were properly machine-stitched onto the uniform. Examples of these flags exist sewn onto a white cotton or wool armband which would have been worn like any other armband. These larger size armflags were also worn by glider troops in the Normandy campaign, and only sometimes by paratroopers. The third type was a flag printed as an armband on a kind of sturdy paper stock resembling wall paper. It had punch holes and came with two safety pins. This type was issued for the Southern France, Holland and Rhine jumps and was worn as an armband or cut or folded and pinned to the sleeve. 509th PIR troopers during Operation Dragoon wore their flags on the left sleeve. There are two variations of this type of armflag, and you will mostly find both described as printed on oilcloth. This is true for the second type, which has a hemmed edge all around, but which is otherwise identical in pattern and size. The first type is not made of cloth at all. As far as I can tell, both types are from the same period. I am not sure if the first or the second type was earlier, or if both came into use at the same time. Photos of this curiosity were sent to me by John Boden in 2012. It’s an invasion armflag with the flag void-stamped and the reverse, which used to be white, stamped with POLICE ALLIED EXPEDITIONARY FORCE. Maybe this was for the newly formed occupation force in Germany after the liberation? It certainly looks like something from the end of the war (similar to the ‘emergency printing’ maps printed on the back side of German maps). In May 2015, Mark Layman from Colorado sent me a photo of his invasion arm flag that looks the same as my type 3, except that it has the letters CL printed in black on the inside. I remember seeing a similar arm flag somewhere, but with a different text. But I can’t find the photo anywhere… I can only guess what CL means. Combat Leader comes to mind, but obviously one wouldn’t want to wear that plainly visible on a white armband. I’m thinking rather something for Civilians, eg Civilian Laborer. The U.S. had patches for non-combatants, but maybe the brassard was an improvised means of clearly pointing out civilians authorized to perform some task helping the army. If anyone knows or owns a similar type of arm flag printed on the inside, please send my a photo. These photos were sent to me by Lisa Sharik, deputy director of the Texas Military Forces Museum in Austin, TX. She read the article on all the different variations and thought she’s share this special one from the museum. It came from Manuel Toundas with the Recon Company, 636th Tank Destroyer Bn, from Operation Dragoon. The museum is about to put it on display. On the inside, it has been marked with PFC Toundas’ details and what looks like the names of other soldiers in his battalion. This article describes the variety of invasion armflags that I have, or have pictures of. I am especially interested in which type was worn when and to get more info about the last type described here. Sure, please send me the pictures so I can have a look at it. D-day minus one – there is a color footage from the 502nd Pathfinders, whose used the 3rd or 4th type american flag on the right arm. They also covered with the gas bassard, but they used it, as the other 502nd from Lillyman’s group!!!! Ran across your site tonight and saw the recent comments. I am particularly interested in the comment by Istvan Pentek about color footage of 502 PF before Normandy…if that exists I have never seen it! Did he send a link to you? Did you follow up with him. Do you have contact? Hi Dave, I don’t have more info, but the link I have in the comment is to http://www.101st-airsoft.com/. Maybe you can contact him via that web site? I have a type 3 from what you refer to it is a printed flag on a very old thick paper like product with holes punched on the ends. It came from george terus who was in the navy in the 40’s on s.s. ancon ship i have tons of info on tbe ship and him. That’s interesting! Do you know where/when he was issued the armflag? Or where the SS Ancon sailed during WW2? Hello, I have what appears to be an invasion arm band it looks to be like your type 3. I would describe the piece as canvas with a satin sheen. on the opposite side it has “CL”in capital letters printed in red. Can you tell me more about this piece? Sorry, the “CL” letters are in black.